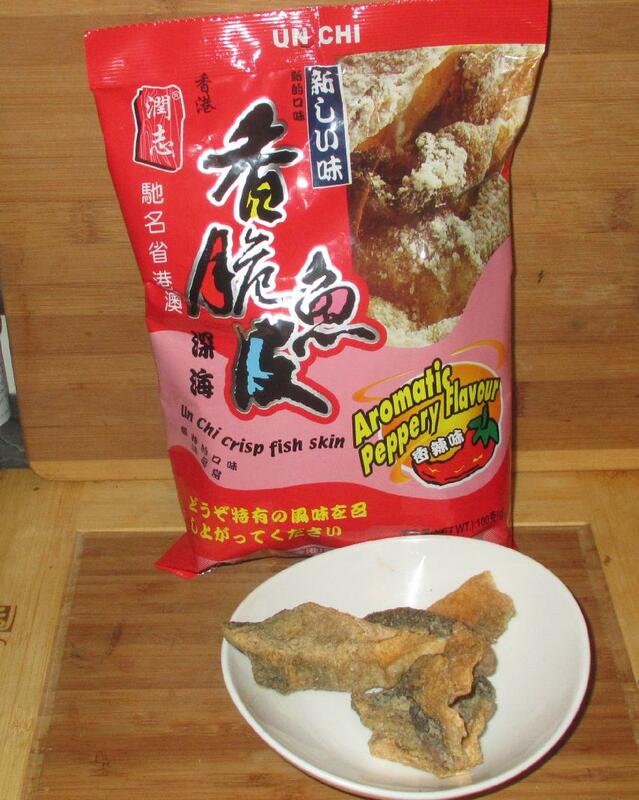 The Ingredients list Fish Skin, Wheat Flour, Vegetable Oil, Pepper, Chili Powder and something called ‘Flavor Enhancer’. Usually, this last ingredient means MSG but this doesn’t appear to be the case here as there is a definite ‘perfume’ like quality to the taste that is a bit reminiscent of Galanga. Normally, I like that flavor but I don’t think it works well here. Fortunately, that element of theexperience is not too dominant and, aside from this, the taste is very much like a less pungent version of the Indian Bombay Duck. The package suggests that you enjoy the product as a snack food and urges you to open the bag and ‘put one in your mouth to enjoy the fun’. Personally, I didn’t experience much in the way of fun when I tried them, but I did like it on the whole and I can see that these, especially the plain ones, would go very nicely with beer. The package also suggests that you try adding the ‘crackers’ to soup, although it specifies that you should do so only 3 – 5 seconds before eating (presumably to avoid the product becoming too soggy). 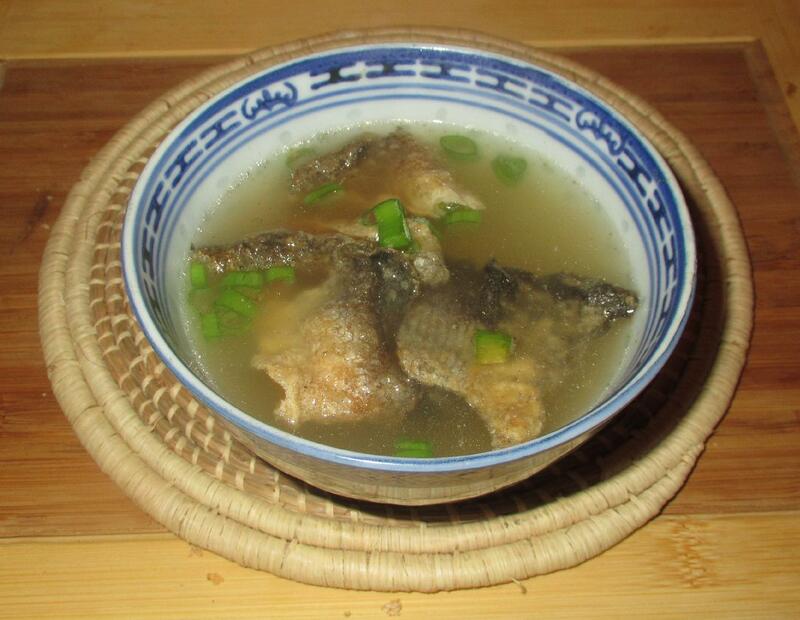 I tried this (as you see above) and put some in a little chicken broth with some scallion. On the whole, the effect was quite nice but I also really like the texture of the skin after it sat in the stock for a few minutes. It ‘reconstituted’ itself an became quite thick and silky. Before making the soup, my wife wondered aloud whether the skin should be crumbled into the soup rather than left in whole pieces. While I don’t think that this is intended, it did strike me that the crumbled product would be great, either alone or with other ingredients, as a Furikake type sprinkle for rice. One could, in addition, also crumble it over a curry much like the aforementioned Bombay Duck. Anyway … I really hope to come across the plain type some point as I think this would, in addition to being a nice snack, be handy to have on hand for a variety of culinary purposes. Have any of my readers tried this yet? My son is constantly reminding me that I should not use the word “love” for inanimate objects. 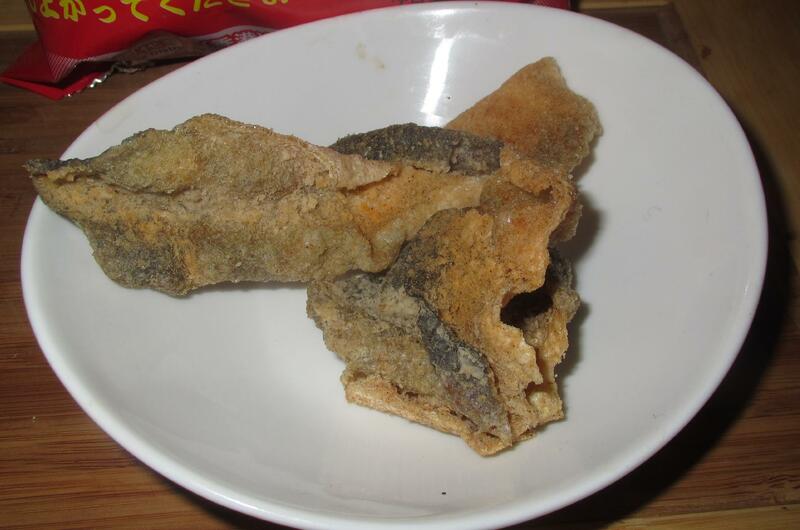 So…may I just say that I really, really, really LIKE crispy salmon skin, right out of the pan! It is a delicacy. I rub the skin on the filet with a small amount of olive oil so salt and pepper stick (pepper has a tendency to scorch but I like it) and sear filet skin side down in smoking hot olive oil until crispy and meat is medium rare, flip, turn off heat, let rest a minute and there she is. Tender juicy meat, and crispy savory skin…together. Let salmon season begin! I do much the same but I love it when the salmon (or Arctic Char) is marinated overnight with just a thin coating of miso and then grilled or pan-fried. Probably a totally unfair comment, coming upon this in the middle of the day – made by myself: yes, absolutely great! picked out of a bag from Honkers, mmh, not very appealing in this case! !